Up to the beginning of this century, the Mesha Stele (Moabite Stone, a royal inscription of a king of Moab named Mesha, ca. 850 BCE) was the earliest known alphabetic inscription. Speculation on the origin of West Semitic alphabets was based largely on the Bible, or traditional attempts to reconstruct the past. A major breakthrough came with the decipherment of the word b`lt, (B`alat) by Sir Alan Gardiner in 1916. Gardiner concluded that the Sinaitic signs were created by reforming Egyptian Hieroglyphic signs based upon their acrophonic value. His reasoning has been found to be sound and his work continues to be the foundation upon which progress continues to the present. His early decipherment's are called the B`alat inscriptions b`lt, (B`alat, ). Hubert Grimme stood alone, with modest support from Van den Brenden, in postulating the existence of a pre-Thamudic alphabet, and rejected the notion that Thamudic scripts evolved from the South Arabic script. He was never able to find such a script (possibly because he looked for it in the wrong desert). Had he looked closer to the birthplace of West Semitic scripts he may have recognized "Old Thamudic" (Old Negev) which was the most probable parent of the Arabian scripts. While Grimme's translations may have some serious defects [the same can be said of all translations before and since his time] his sign lists showing the correspondence of Proto-Sinaitic &Proto-Canaanite to Egyptian Hieroglyphic signs is very helpful and was as well done as any others of more recent vintage. In 1927 a Harvard University Expedition in the Sinai made a side trip upon their return from Santa Catherina through Serabit el-Khadim. They removed some inscriptions left by Petrie and delivered them to the Cairo Museum. They also increased the corpus of Proto-Sinaitic inscriptions by three (Lake, Blake, and Butin 1928). Winnett was a tireless researcher of the nine or ten pre-Arabic scripts of the Arabian Desert, among which he spent a major part of his professional life. He also attempted to reconstruct the emergence, and identify some relationships, between these alphabets. 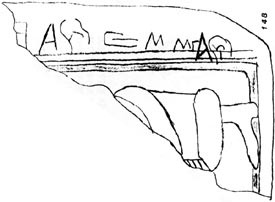 No doubt his work with pre-Arabic scripts was excellent but his brief exposure to Old Negev resulted in his participation in perpetuating the error that the Negev inscriptions were graffiti left by post Thamudic vagabonds. The extensive research and study of J. R. Harris & D. W Hone has led to a more probable and substantial conclusion, i.e. that the Negev inscriptions are Post Proto-Canaanite and the major parent script of the pre-Arabic Thamudic scripts. The following graffiti (fig. 1. pl. XXII), which Mr. E. Anati has very kindly allowed me to study, are all of the type which in my study of the Lihyanite and Thamudic Inscriptions, Toronto, 1937, I labeled Thamudic C and dated to the 1st or 2nd centuries C.E. (p. 52). They may be as late as the 3rd century (see A. VAN DEN BRANDEN, Les inscriptions thamudeennes, Louvain, 1950, p. 24), but in the present state of our knowledge it is impossible to be more definite (Winnett, 1959, p. 146). No doubt the above collection was gathered by Emmanuel Anati in April of 1954 & January of 1955 and was the bases for his articles in P.E.Q. of July/Dec. 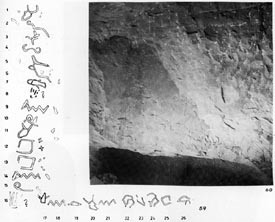 1954, "Ancient Rock Drawings in the Central Negev," pp. 49-57. 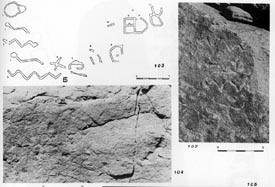 Jan/June 1956, titled, "Rock Engravings From the Jebel Ideid (Southern Negev)." 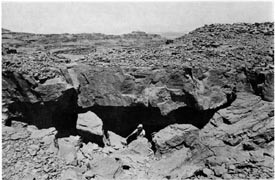 The above site (Jebel Ideid) is now called Har Karkom (of which more will be said later). Anati called the inscriptions Thamudic-Nabatean, style IV2, and Winnett called them Thamudic C. 1st to 3rd Cent C.E.. More resent research has made it clear that neither of the above two men had a clear perception of the nature and origin of the script in question. Albright's publication was a major step forward in that it included transliterations and translations of all of the Proto-Sinaitic inscriptions identified up to that point in time. We have some reservations with Albright's translations because it is now possible to recognize ligatures and consequently assign them the several sound values they represent (rather than viewing them as single signs with an elaborate flourish). Also no-one (in that period) recognized the clues that signal a word break, but each translator was left to arbitrarily decide where these breaks should be made. I. Beit-Arieh BAR, Winter, 1982 p. 13. Beit-Arieh was a Senior Research Associate and Lecturer of the Institute of Archaeology at Tel Aviv University. Since 1971 he has been the director of the Ophir Expedition in the Sinai Peninsula. His work at Mine L, in the Serabit el-Khadim area was of great importance in establishing 1500 BCE (the cave-in date for Mine L.) as a time when there was a reasonably mature alphabet, reinforcing the probability that Proto-Sinaitic began to emerge about 1700 BCE. 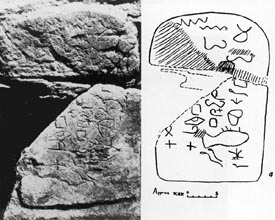 Early on, the Ophir Expedition became an extension of the 1927 to 1935 Harvard expedition, not because Harvard had joined them but because they could see that they had a possibility of successfully dating the Proto-Sinaitic inscriptions (which had been a major objective of the Harvard project). Mine L, had not been excavated by Harvard because cracks in the over head made them fear a cave-in if debris was removed. After appropriate precautions had been made the Ophir crew began a three week task of removing debris (1977). Each stone, large or small, "was carefully examined twice before being discarded" (Beit-Arieh, BA, Winter, 1981, pp. 14-15). The dating of the above finds is a key issue in the present study, because only archaeological evidence of this kind can bring us closer to solving the problem of the period of the Proto-Sinaitic inscriptions. Since Mine L contained another inscription besides the one carved on the rock inside it, we may assume that all the finds are contemporaneous and were buried at the end of a single mining season. Weighty evidence for dating the find to the Late Bronze Age (the New Kingdom in Egypt) is a sherd from a bichrome flask found in the mine. The sherd is burnished and decorated with black and brown stripes on a light ground and belongs to a class of pottery ubiquitous in the Near East in the Late Bronze Age between the 16th and 14th centuries BC. Parallels for axes occur in occupation levels and tombs from the time of the New Kingdom in some places in Egypt, as well as on wall paintings depicting their use. . . The ax was probably the symbol of the miners. . . 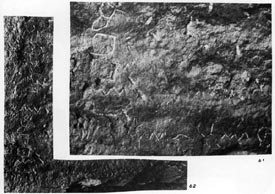 The many finds of the Late Bronze Age discovered during the clearing of Mine L. together with the Proto-Sinaitic inscriptions discussed here strongly suggest that the mine was worked and the inscriptions carved in this period [LBA](Beit-Arieh, 1981, pp. 17-18). I. Beit-Arieh BAR, Winter, 1982 p. 18. 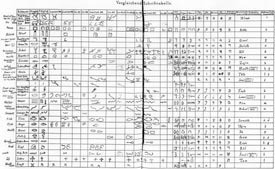 In 1988 a very important doctoral dissertation was completed at Tel Aviv University, by Benjamin Sass titled, The Genesis of the Alphabet and its Development in the Second Millennium BC, Agypten Und Altes Testament, Band 13, in Kommission bei Otto Harrassowitz, Weisbaden. Sass had been a student of Beit-Arieh and spent considerable time in the Sinai as a deputy officer of the Israeli Antiquities Department. The origin of the Phoenician letters [and even more so the Old Negev letters] in the Proto-Canaanite and Proto-Sinaitic scripts, and the borrowing of most, if not all, letter forms in the latter script from Egyptian hieroglyphics on the basis of acrophony are now seen as indubitable facts (cf. Snyczer 1974, 9). 91. 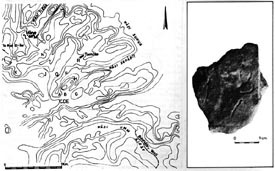 Sinai 376 (Rainey 1975, fig. 1) Sinai 380 1978 fig. 10). The bracketed insertion in the paragraph above was justified by the research of Harris and Hone in which they discovered that twenty one of twenty-two Canaanite/Phoenician sound signs are clearly of archaic origin; i.e., they retain a clear correspondence to Proto-Canaanite and Proto-Sinaitic. Out of a shorter list of twenty Old Negev sound signs positions, forty-two are archaic. The number forty-two is possible because each of the twenty Old Negev sound positions may have several abstract alternative signs and several alternative archaic signs. The above short sign lists were used because their study was confined to signs found in the inscription of the Land of Canaan, the Negev and the Sinai that were included in their research. Old Negev has a stronger link to Proto-Canaanite and Proto-Sinaitic than does Canaanite Phoenician. 61. Sinai 357 (courtesy of Prof. 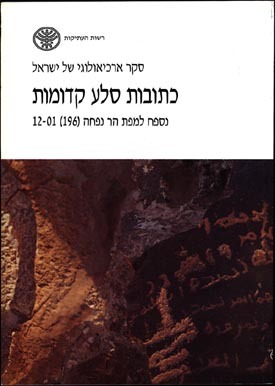 I. Beit-Arieh, Institute if Archaeology, Tel Aviv University) obtained by B. Sass 1988) 62. Sinai 357 (Butin 1936, pl. 16). Sass and Beit-Arieh carefully made an on-site verification of the several renditions made by earlier scholars of Sinai 357. As a result Harris and Hone proceeded with confidence to observe in this inscription one of the earliest uses of identifying word breaks by changing the size or shape of a letter (in the column letters #'s 12-13). The phrase involved reads, = "for `Avev." 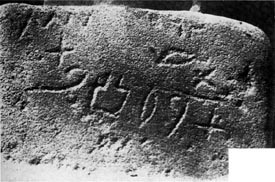 If at one time it was assumed that inscriptions discovered in the Negev were but the traces of Thamudic tribes passing through the region, particularly along the main trade routes, this assemblage of inscriptions, as well as additional inscriptions, published and unpublished, now calls for a reevaluation of the subject. Archaeological evidence from the first and second centuries (CE) - the presumed dates of the inscriptions - is insufficient to establish the history of settlement in the region, especially insofar as settlement and sedentarization is concerned. 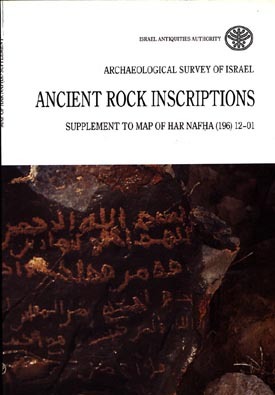 Comprehensive epigraphic research could contribute a great deal to this complex subject (Moin Halloun, 1990, Vol. 2, p. 36.). Research of Harris and Hone, conducted from 1994 to April of 1997, focused on verifying some of Halloun's photographs and transliteration by an on-site examination. Their conclusion was that the inscriptions at Nahal `Avedat date to the period of the colonization of the Negev enacted by the Royal Kings of the House of Judah to secure safer trade lanes from the Gulf of Elath to the Mediterranean (six to eight hundred years before the dates suggested by Winnett). Harris and Hone (aided by Jon & Cindy Polansky) now have a growing corpus of about 130 inscriptions from the Negev. 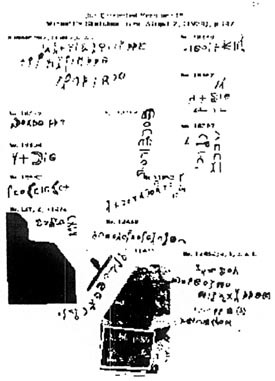 From a careful examinations of the twenty two sound signs (each sign having from one to nine alternative forms) they have concluded that a large number of archaic forms are retained in use and that this "Old Negev" alphabet is the ancient parent of the Thamudic scripts. 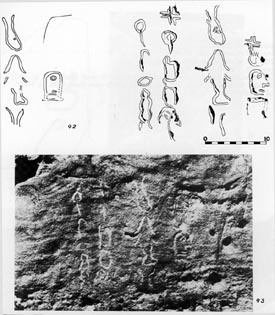 Observing the inadequate translations of Winnett, Harris was encouraged to begin with a careful study of the signs and the result was that the abundance of archaic letter forms and archaic construction and usage demanded that this script be considered an early post Proto-Canaanite script and not a pre-Arabic dialect script. As a post Proto-Canaanite script it was best translated in Hebrew (i.e. pre Massoretic Hebrew). In the years that followed James R. Harris and Dann W Hone expanded their corpus of "Old Negev" inscriptions. They abandoned the misleading word "Thamudic" because Old Negev (1200 BCE) is the ancient parent of the Arabian Scripts, while Thamudic (pre-Christian) is a late offspring. We have discovered a script in the Negev of Israel that appears to be a local variation of Proto-Canaanite [a generic formative script widely used among Canaanite peoples during the second millennium B.C.]. This local variation, which we call the Old Negev script, was widely used by Negev Canaanites (such as Kenites and Israelites) from 1200-600 BC. In the interest of not straining the strong indications from archaeology, inscriptions, and the Bible that the major carriers of this script were Midianites we call this script Old Negev and identify its carriers as ancient Canaanite people or peoples. This Old Negev script not only has a distinctive sign system with features that go back to it's Proto-Sinaitic parent script but also a grammatical structure persisting from Proto-Sinaitic through Proto-Canaanite to Old Negev. These distinctive characteristics were not passed on to Canaanite/Phoenician or to Old Negev's offspring scripts of the Arabian desert. Therefore these features will become "ear marks" for the identification of this script where ever it may be found and must be clearly presented so that all may judge the certainty of our observations. With a collection of over one hundred and thirty inscriptions this study has opened a small window to the early (pre-Exile) history of Canaanite peoples of the Negev. And since twenty-five percent of the inscriptions contain names of the God of Israel (Yah, El/Yah, Yahu, and Yahh) it seems fair to say that these Canaanite speakers had a covenant relationship with Yahweh. Old Hebrew: = Stoned to death for love (of a) Seer. Some General Characteristics of Old Negev that were not continued in Canaanite/Phoenician or in the pre-Arabic scripts of the Arabian Desert. 1. Sign Rotation; the orientation of a sign can signal the reader that, when in horizontal position, it represents an inseparable preposition or an article. 2. When in an upside down position it represents the end of a word or phrase. 3. When a letter is larger or smaller than the preceding letters it indicates the end of a word or phrase. 4. The numbers 2 & 3 above also indicate the direction of language flow. 5. All West Semitic alphabets (emerging after Proto-Canaanite) utilize the abstracted forms but Old Negev retains in use a very large number of archaic forms (i.e. Proto-Sinaitic and Proto-Canaanite forms). 6. Old Negev also retains an elaborate use of ligatures to create symbols that often complement or enhance the inscriptions. [This form of composition was especially useful when a population was a mix of literate persons and persons with varying levels of illiteracy.